SEO requires a lot of hard work and effort. And the devil really is in the details. Writing the longest article on a topic or tagging keywords isn’t enough. If you want home-run results, you have to put in the work. But this article is about one specific aspect of SEO. One that is often overlooked. I’m talking about picking a web host. You may be thinking, “What?! Web hosting isn’t a ranking factor!” But hear me out. Picking the right (or wrong) host can definitely have an impact on your SEO success. At the end of the day, search engines reward sites that provide valuable information effectively. Unless you started your online business using a site builder platform, your chosen web host could make or (literally) break your site. Let’s take a look at 5 of the ways a good or bad web host can impact SEO results. One factor that determines your site’s SEO performance is speed. The faster your site loads, the higher chance it has to organically rank in search. We’ve written about this extensively. Check out our guide on improving site speed, and our case study with GTMetrix. Your site’s stability and loading times can depend heavily upon the quality of your web host’s servers. And this can be a nearly impossible to overcome by ancillary methods. Stripping out plugins, optimizing images, and other standard speed improvements will hardly make a dent! 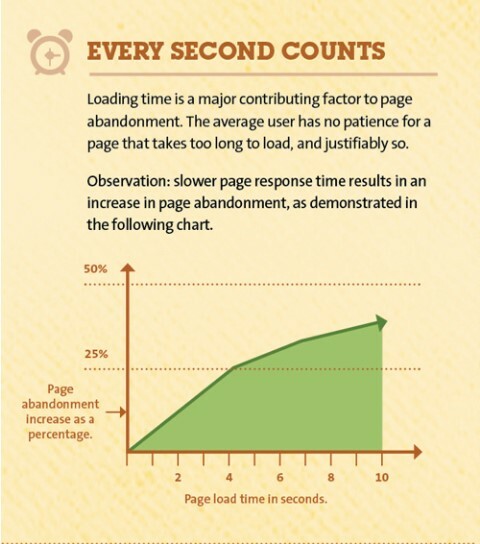 As we well know, slow loading times cause visitors to bounce. That will hurt your SEO in the long-run. For starters, let’s be clear and fair. Even the best web host servers simply cannot guarantee 100% uptime. Things happen. That being said, top tier web hosts will usually boast “five nines” uptime. Meaning, 99.999%. That equates to 5 minutes and 15 seconds or less of downtime in a calendar year. Not bad! Whether you like it or not, there will be intermittent periods when your site won’t be available for visitors and search spiders. Therefore, you can only hope for the lowest downtime possible from your web hosting platform. The uptime/downtime of your web host depends on the resources used for its servers. The higher the server specs, the more expensive your subscription will be for that web host. 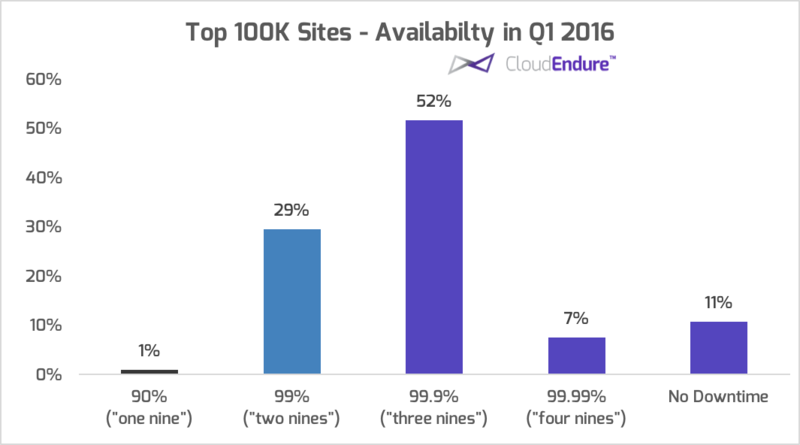 According to a study conducted by CloudEndure, 52% of the top 100,000 sites had a “three nines” or a 99.9% uptime, which is equivalent to 8h 45m 57.0s downtime in a year. If your hosting provider guarantees the same downtime, then you’ll fall smack dab in the middle of the pack. Usually a safe enough place to be. If you notice you’re having regular downtime issues, it may be time to upgrade and swap hosting providers. While Matt Cutts has reassured us that intermittent downtime for short periods of time won’t affect rankings, rankings can be impacted ff your site stays down for longer periods of time. To keep a closer eye on your site’s uptime, I’d recommend setting up a monitoring system like Uptime Robot. It’ll send you notifications when your site goes down and when it comes back up. Nobody wants to think about this, but it’s a fact of life. Sometimes, we face disaster. There will always be a possibility that you’ll lose the data on your site. Whether it be from a malicious attack or a natural disaster that wipes out a server farm’s physical location, the end result will be the same. Catastrophe for site owners. Lost data. Lost rankings. Starting from scratch? It could easily kill a small business on the spot. To protect yourself from the worst consequences of these unfortunate scenarios, it’s critical to have backups of your site. Many hosting providers offer backup services out of the box. They’ll update on a regular basis and have all of the right redundancies in place. This is the perfect solution for many site owners. No third party subscription or service necessary. Just choose the right host! If you have backups in place and disaster strikes, it’ll be a simple affair to restore from a backup saved by your hosting company. After a small hiccup, business can resume as usual! It’s worth noting that some hosting providers don’t offer proprietary backup services. Instead, they’ll often provide a third-party backup service such as CodeGuard. These offers will often be at a discounted price, and can be a perfectly viable option if you don’t have a favorite backup service already. As a business owner, you probably already know this. But it bears repeating. Trust is everything. In order to build trust with your audience, you’ll want them to feel safe and secure when they browse (or checkout) on your website. After all, your site is the bridge that connects your audience with your brand. One critical way of establishing trust on your site is through an SSL (secure sockets layer) certificate. SSL certificates encrypt the exchange of data that takes place between a user’s web browser and your server. It stands to reason that Google would care about this as well. At it’s core, Google wants to continually improve the internet experience for users worldwide. So as early as 2014, Google acknowledged that SSL certificates were indeed a ranking signal in their algorithm. We’ve actually written about switching to HTTPs at length. So if you’re curious to learn more about why it matters, just click that link! If you decide you want to switch to HTTPs, you can purchase an SSL certification from sites like SSLs.com. But in many cases, going through your web host will be a lot easier. 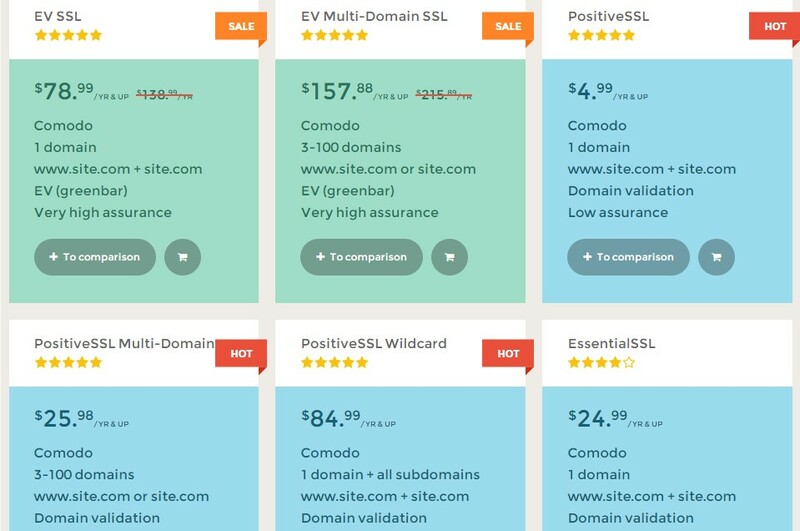 Some hosting companies even offer free SSL certification and you’ll be able to activate the certificate on your domain within a few minutes. Other web hosts will require you to purchase the certificate from a third-party, but will help out with the setup afterwards. Unless you’re confident tweaking your control panel, it may be best to pick a web host that offers more robust SSL setup support and options. Many small business owners pick shared hosting, often due to it’s relative affordability. But fair warning, it comes with some serious drawbacks. For starters, there are unsubstantiated rumors that your site’s search visibility will drop off if other sites on your shared server are spammy or low-quality. A few years ago, Google released a video denying the correlation between shared hosting and SEO performance. But we all know that sometimes Google says one thing and then does another. Despite that potential negative, there is another downside that’s slightly more tangible. And it has to do with Google crawling. Specifically, Google has certain limits on indexing and they’re based on IP addresses. So, if a shared hosting IP is already eating up too much Google crawler time (either because there are a ton of sites, or the other sites on the IP are exceptionally large), your site may take longer to index or be updated in the SERPs. There are other reasons that I would recommend against shared hosting as well, but they’re not related to SEO. For instance, if another site on your shared IP is attracting a lot of traffic, the server will usually dedicate a larger portion of its resources to that site. This could slow down your own site, which isn’t good for business. In short, if you can scale and predict your website’s growth, then I’d easily recommend going with a dedicated hosting provider from day one. One good thing about web hosting in general, is that it’s quite fast and easy to switch hosts. Before blindly changing your web host though, do some research! Check out reviews, look at features and pricing. Consider the 5 factors we discussed above. Does the web host you’re eyeballing have a compelling backup service? Do they offer SSL certificates? There are so many hosting companies to choose from (and so many factors to consider) that it can easily be a little overwhelming. So filter your prospective hosts based on what you learned above. But don’t wait too long before taking care of this potential headache. Search engines are continually improving upon their ability to return relevant and high-quality pages. Trust, security, and reliability are things that are going to remain in focus for those algorithms. If your site loads slow or is down a lot of the time, you better believe the search engines will take notice and react accordingly. So be sure to take the time to carefully consider your web host, and make a change if you need to. It can only help!